Located within the Black Hills of South Dakota, Mount Rushmore is home to a number of wild animal species that thrive in the protected lands surrounding the famed monument. On a hike through Mount Rushmore National Memorial or the Black Hills National Forest, you have the opportunity to see a range of animals, from mountain goats and cougars to tiny chorus frogs. Mount Rushmore and the surrounding area is home to a number of large mammals, including Rocky Mountain elk, bighorn sheep, white-tailed deer and mule deer. These large, hoofed animals provide a food source for another of Mount Rushmore's large inhabitants, the mountain lion or cougar. Red foxes, bobcats and coyotes also call the Black Hills home. Perhaps the most iconic of Mount Rushmore's large mammal species isn't a native to the area at all. Six mountain goats were accidentally introduced into the Black Hills in 1924 and the species has maintained a population there since. 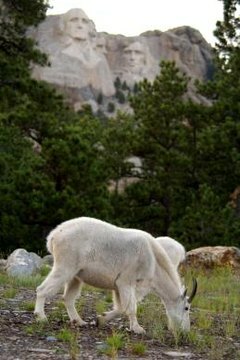 The mountain goat's range overlaps with popular tourist areas, including Mount Rushmore and Harney Peak. Large mammals aren't the only ones you may encounter at Mount Rushmore; many smaller species thrive around the monument. Rodents such as yellow-bellied marmots, least chipmunks, beavers and porcupines reside in the Black Hills, as do a number of squirrel species, both tree- and ground-dwelling. Other small mammal species you might see include rabbits (cottontail and jackrabbits), striped skunks and raccoons. Several species of bats reside near Mount Rushmore, roosting in caves, crevices, abandoned mines, trees and buildings. These winged mammals help to control the population of flying insects in and around the National Memorial. The Black Hills have a diverse population of birds, including songbirds and large birds of prey. Game birds like turkeys and ruffed grouse live near the monument, as do common birds like crows, turkey vultures and mourning doves. Birds of prey in the area include great horned owls, osprey, kestrels and Cooper's hawks. Many species of woodpeckers can also be found, like the northern flicker, red-naped sapsucker and hairy woodpecker. Many birders visit the Black Hills to see the colorful songbirds. Species like the western tanager, mountain bluebird and plumbeous vireo can be found in the pine forests surrounding the monument. The Mount Rushmore area is also home a several species of reptiles and amphibians. The Black Hills redbelly snake not only makes its home in the area, but can be found nowhere else on Earth. This small snake species may look plain at first, as its back and head are a dull gray; when turned over, however, the Black Hills redbelly snake reveals its namesake -- a brightly colored streak along its underside. Three species of frogs also reside at Mount Rushmore National Memorial. These include two species of chorus frogs -- striped and western -- and the northern leopard frog.